Check out if The Big Issue is in The Top 100 NGOs 2013 Edition! Offering a ‘hand up’ to the homeless. 20 years of expanding impact. Though not the prototype – that distinction belongs to Street News in New York – The Big Issue has been the leader in the ‘street paper’ movement, demonstrating both the sustainability of a pioneering social enterprise model, as well as a long term commitment to addressing the challenge of homelessness worldwide. Founded in 1991, the organization is guided by the philosophy of a ‘hand up, not hand out’, helping thousands of individuals to regain control of their lives and simultaneously altering public perceptions of the homeless. The Big Issue consists of two parts – a non-profit company that produces and distributes The Big Issue magazine to a network of street vendors, and The Big Issue Foundation, which exists to help those vendors gain control of their lives by addressing the issues that have contributed to their homelessness. In the United Kingdom, vendors buy the weekly magazine for £1 and sell it for £2, thereby earning £1 per copy. Any post-investment profit generated through the sale of the magazine or advertising is passed on to the foundation, which offers advice and referrals in the areas of housing, health, finances, education and employment. 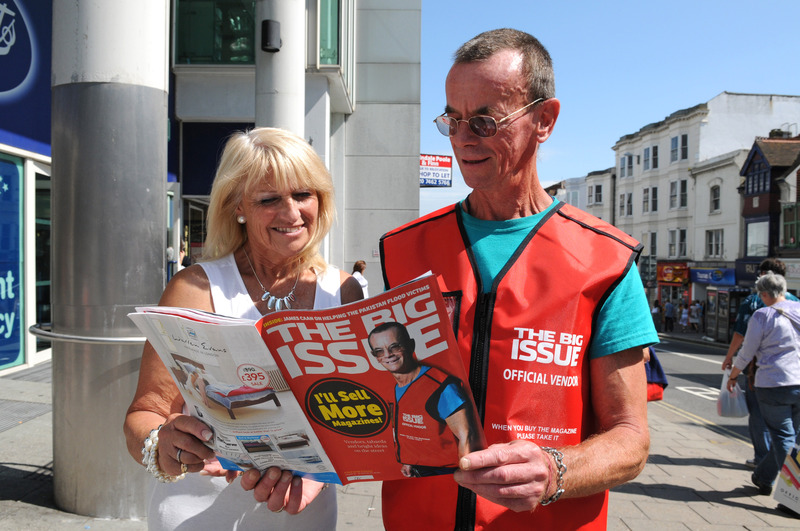 Officially published in ten countries, and replicated in many more, The Big Issue has been recognised as one of the world’s most successful social business models.